There are versions of this exciting adaptation of Tag for the Atari (16K required) and PET/CBM with Upgrade or 4.0 BASIC. Each game involves a special extra feature which makes the action all the more challenging: the pursuer can become the pursued without warning and without tagging the other player! When playing real-life tag with only two players, nobody really wins because the number of tags per player remains constant. But in computer Tag, the clock decides who will be the champion. Every 15 seconds, if the person who is It cannot tag the other, the computer will reverse the It player. This feature allows a real fight for points. If you are not skilled in attacking, you can become skilled in evasive tactics and win the game. Before the game starts, the players must input their names. Then, the computer will ask for the "color" of the playing arena. "Color" simply describes which keyboard character will appear as the border of the arena. Then, you set a point limit by inputting a number from one to infinity. Game length is determined by the amount of time it takes for any one player to amass the predefined number of points. The computer then draws a large square area the length and width of the screen and fills this area with 180 obstacles that players must dodge in their quest for victory. The PET number pad serves as the control for the right-side player. The "QWE", "ASD", and "ZXC" keys serve as the controls for the left-side player. These are movement controls, and the "5" or the "s" keys will stop the player from going further than he wishes. To quit a game in progress, typing "%" will cease all function, and no points will be given to either player. This feature exists because the computer will sometimes surround a player with obstacles before battle, causing a shutdown of the afflicted player's actions. The sound effects in Tag are mostly simple loops. The sound output is for CB2 sound users. If you are not using sound, or just want to make the game movements a little faster by eliminating the sound loops, just remove the sound GOSUBs (lines 10-81) and install RETURNS. There are six different sound effects. Plug a joystick into jacks one and two, and get ready for some furious chasing and dodging. After the game initializes, each player can type in his initials three letters). You then select the final score (what play to) from 1-10. Press OPTION to increase the final score, and SELECT when the desired number appears. The game will begin with player one in the upper left-hand corner, and player two in the opposite corner. Player one will be flashing, which indicates that he is It. Whoever is It has to chase down and catch the other player in order to claim a point. If It fails to score within 15 seconds, the players "switch roles," and player two is It and has his chance to catch player one. The "switcheroo" is signaled by a loud bell, so when you hear it, change direction fast! Play consists of It trying to catch the "victim" as fast as possible, while the "victim" tries to evade It for at least 15 seconds. Both players must maneuver about the screen, turning and twisting among a maze of pink rocks. But if you dally loo long, the rocks will wake up, open their eyes, and further confound the conflict. Don't let one of the Living Rocks touch you. Tag for the Atari uses character graphics in graphics mode one, but with a twist. Usually, if you want a redefined character set along with letters and numbers, you are limited to redefining punctuation and other special symbols and have to wait 10 to 15 seconds for a POKE loop that downloads the ROM character set to RAM. Tag, however, uses a Display List Interrupt (DLI) to "flip" the character set midway down the screen. This lets you use the upper portion of the display for normal text (using the entire character set), and the lower portion for as few or as many custom characters as desired. 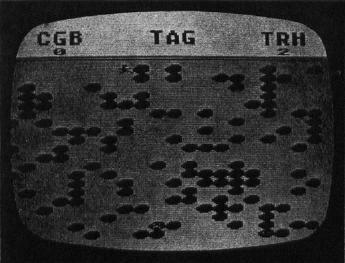 The DLI Used in Tag also changes the screen colors, so you get five colors in each portion, for a total of ten simultaneous colors. Another interrupt-driven machine language routine in Tag uses Count-Down Timer #2 to "flip" the character set pointer every 16/60ths of a second. In Tag, there are two character sets. The first character set, for example, displays one view of a running person. The other character set, at an offset of 512 bytes, displays another view. When the CHBASE pointer is switched between the two views, the character appears to be running. Character set flipping can also be used to represent blinking, flashing, spinning, bouncing, or any other simple motion. And, since the flipping is controlled by machine language, the motion is fast and regular. It also simplifies the BASIC program.